This will be hard to fix, since I have no idea what could cause it and since it's not happening to me, I can't even check if I actually did fix it. But will try to check what could be the issue. Does it happen if my addon is the only addon enabled? 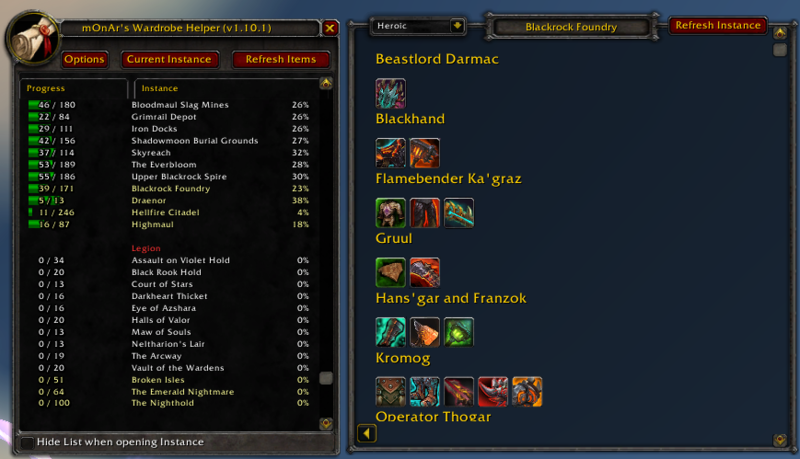 If no is there any chance you could figure out which combination of addons makes it happen? Mana-Tombs is now working when you click Current Instance with the 1.5 Update, Thanks! 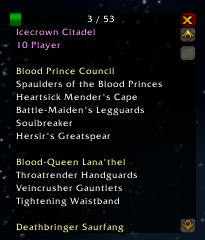 Sigh, Blizzard and their instance naming. Thanks, will try to fix that asap. Actually works fine for me. Do you have English client? And could you use "/dump GetInstanceInfo()" while in Mana-Tombs and write back the result please? I'm using an english client and sorry I think it was a misunderstanding, I was saying that Mana-tombs is working correctly now with the current instance button. though I'm currently in Magister's Terrace and Current instance button does not work, opening it manually works fine though. Oh yes, I misread, sorry. Will look into Magister's Terrace problem. Awesome! Just what i've been waiting for! Any chance for an option to group the instances by expansion? Awesome addon so far! One suggestion/bug it appears that when you go to the transmog vendor the button is right on top of the collection progress bar at the top. The button is moved in the latest version. Would you be able to add a feature to filter or sort instances by type and/or expansion? For example, if I only wanted to see WotLK dungeon items, I could filter everything else out. Thanks for the addon. Any plans for a clickable button in the journal, a minimap icon, Titan Panel support, or something similar? There's button in the Wardrobe collection manager. Minimap button is planned, Titan panel support would be cool. But currently there are more important things to do. So maybe in the future. I hadn't even noticed the button on the appearance tab. Since your addon is about dungeons and raids, I was looking in the journal. You might want to include in the addon description that the button is on the appearance tab. Was added, but i have tried to enter Ramparts and a few other and then press the "Current Instance, nothing happened, no window popped up. So not sure how it works tho, or if some other addon is interfering with yours, but thought i wanted to ask, and then now i will go try disable addons a few at a time to see if its one of my other addons the is preventing this. Do you have English client? while in an instance that it doesn't work for? If the name of the intance (which should pop as first after using that command) isn't exactly the same as the name of the instance in the addon list, that's the reason for it to fail. And if that's the case it means Blizzard uses multiple names for the same instance what makes me sad, cause fix won't be simple. I personally tested it only in BWD.